My experience in web designing – simple HTML with no CSS – sprouted way back in fourth grade, when my teacher taught us computer literacy in Computer Science class. It was also my first taste of the wonder called “the internet” (the first website I visited was Wikipedia). The things I did were very simple: I coded very basic HTML documents. I couldn’t even remember if I used any CSS at all back then. 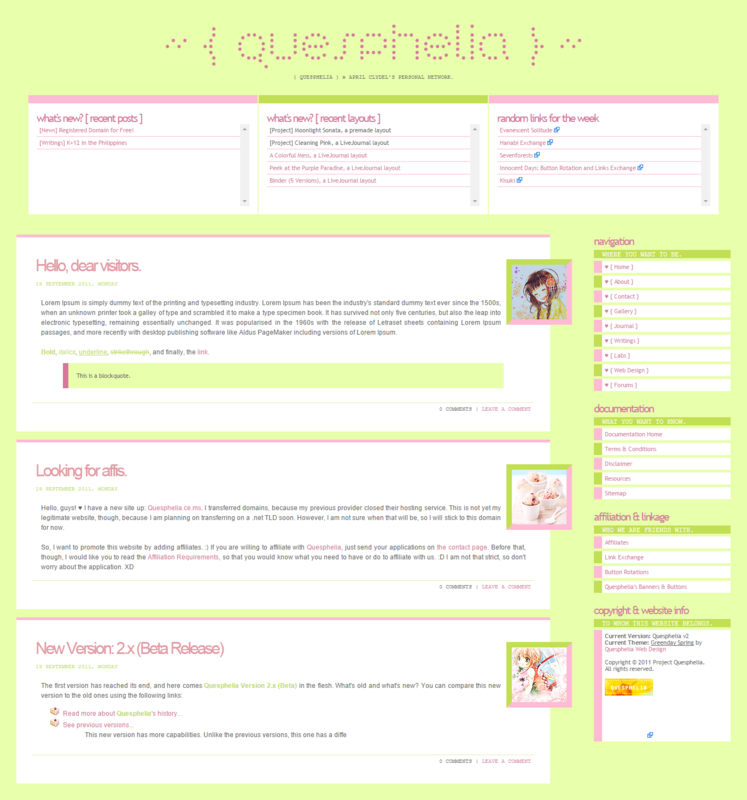 My real interest in web designing appeared when I started writing on LiveJournal. I was so enamored by all the different, beautiful customized stylesheets to choose from! 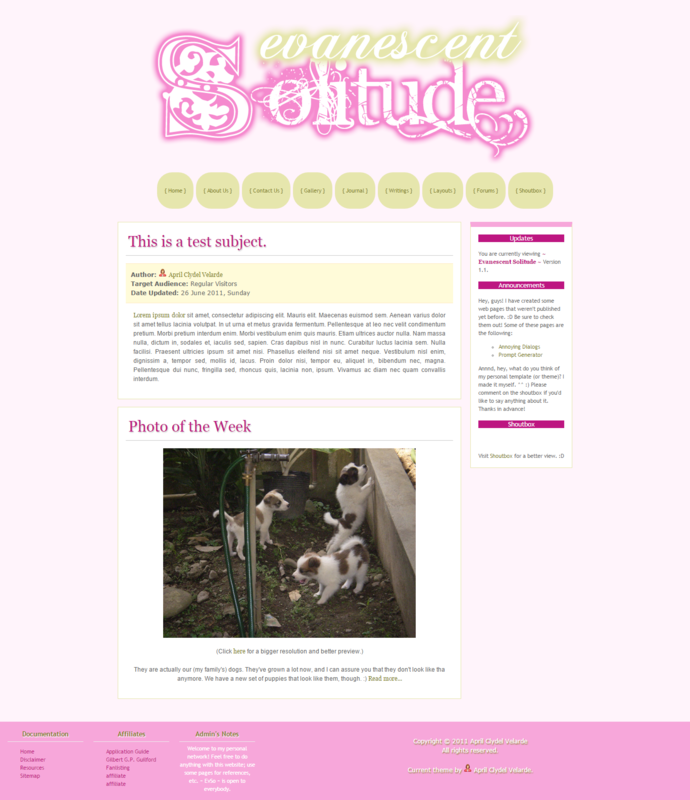 Later, I started making my own LiveJournal layouts, too, and shared them to other users on LJ communities. I was 13 years old then. And then, I discovered graphic websites and web design galleries (not sure which one came first). Web design galleries gave me inspiration to work on my own web designing skills. Graphic websites made me think that it was possible for me to have my own websites and designs published on the internet. Out of curiosity and excitement, I started hunting for free web hosts. Meanwhile, I started coding my websites from scratch, having categories such as writings, graphics, designs (layouts), and the like, but there weren’t much content yet. My first website was Blissful Euphoria. It didn’t last very long; after a couple of days or weeks, I decided to change its name. The change resulted to my second website, Evanescent Solitude. These two sites were very similar. Their contents include gallery (for my photographs), journal, writings, layouts, and forums. All of these categories did not have content at all, except for a handful of photographs under gallery and my LiveJournal layouts under layouts. Looking back, I can say that these websites were more about the idea and potential, instead of content. After my second website, I noticed that my site names were quite long (I had the preference for obscure words), but instead of using short words, I started coming up with original words for site names. My third website was Ephevattica. It inherited the same categories and contents from my previous two sites, plus a new category: labs. My idea of this category was that it was a place for fun and entertainment. My first project under labs was No Fun. 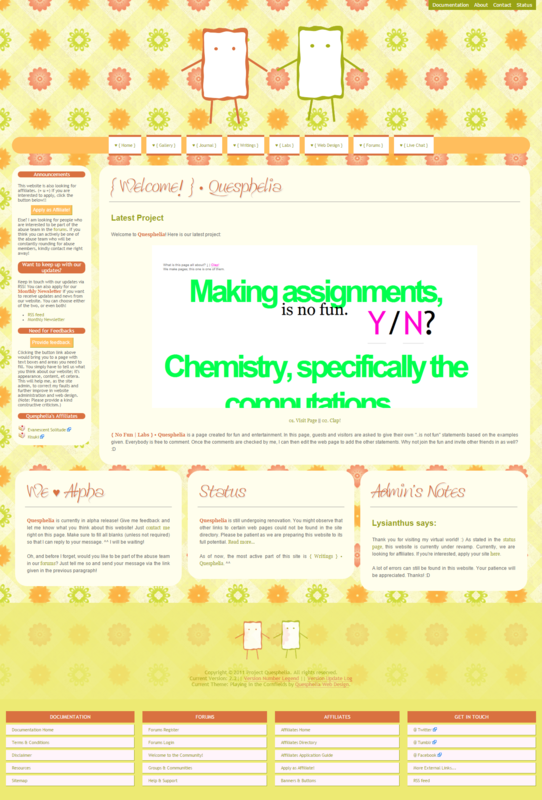 Although this site didn’t have many contents, too, my web designing skills definitely improved. Not long, I also renamed Ephevattica to Quesphelia. It was basically Ephevattica with a different name and layout. These four websites – although they were uploaded online – were never public in the sense that I shared them to other people. There were no visitors except for me. I never advertised them, either. I had a lot of fun practicing and playing with my own skills. And these four happened so quickly! I wouldn’t be surprised if I had all these websites and changes within two months alone. Later, Evanessencia happened. Evanessencia was my first legitimate website. I added more categories and features, and organized my contents better. I also started creating more content for my website. I went out of my shell and started affiliating and exchanging links with other graphic and resource websites as well. People started visiting my website, and this motivated me to improve my skills more and more. After a year, I finally bought a .net TLD for Evanessencia! Undoubtedly, out of all my previous websites, this was the longest that ever lived. Time went by, everything was going great, until one instance when someone associated Evanessencia to a band named Evanescence. Since I wanted my own site to have its own identity without any associations with anything, I decided to rebrand. Evanessencia underwent one name change (Aethyme), which did not officially happen after having designed a layout for it, before I ultimately decided with a new site name. Affelius is Evanessencia remodeled. This is the now. Hopefully, with improvements! And we’ll continue on improving!